"Show that BGK is not the only one who has heart... but no one has the crown yet so stay hungry and humble TNT and real TNT fans... BGK is at their best when their back is against the wall." As a result, Paul Harris had 26 points and he was named as the best player of the game. He said that he's not thinking too much about the best import award. 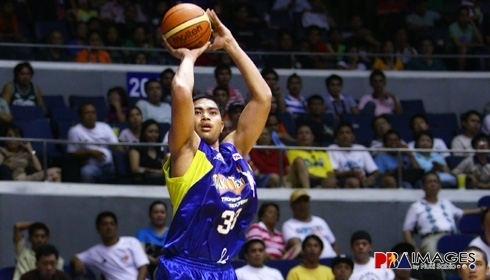 He is in the PBA serving the Talk 'n Text Tropang Texters to win a championship. He's all business. Jason Castro, the former superstar of the PCU Dolphins showed that he is the yellow flash of TNT. He had 16 quick points. Ranidel De Ocampo, the hero of game 3 had 11 points and the mighty mouse, Jimmy Alapag had 11 points. For Ginebra, their biggest problem is on how to get their import going in this series. Nate Brumfield, the best import of the conference is having a hard time against the Texters. His inside game is not clicking. Talk 'n Text is ready to sacrifice their body against the bulky Brumfield. Brumfield and Caguioa only had 15 points each. Tubid pitched in 11 points, Miller also scored 11, Cortez with 10, and Menk with 8 points. The defense of Ginebra was the suspect in this game. They had great offense in the first half but when TNT made a run in the third quarter, Ginebra's defense collapsed. TNT on the other hand was firing on all cylinders and their execution was almost perfect in the second half. They're like surgeons who seemlessly cut through the body of Ginebra.